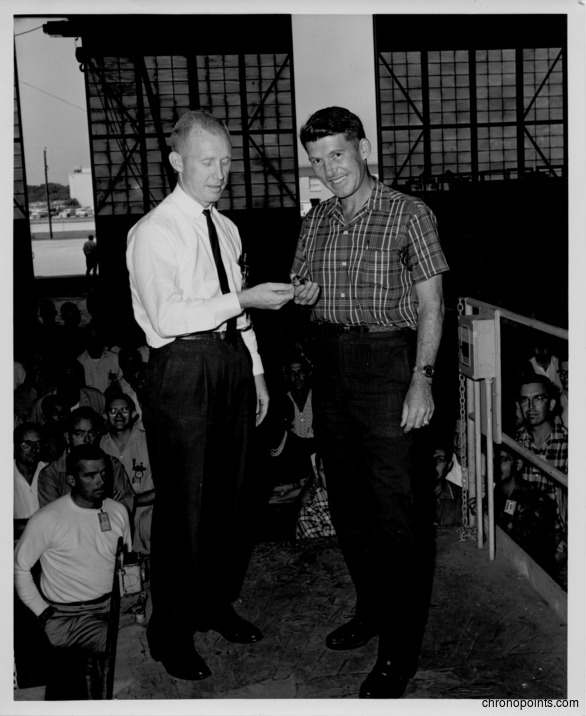 Dr. Cal Fowler (1929-2013), on the left, presenting the launch key to astronaut Wally Schirra (1923-2007) Dr. Fowler, the Launch Conductor at Cape Canaveral Air Force Station (CCAFS)'s Launch Complex 14 (LC-14) in Cape Canaveral, Florida, used the key to launch Schirra's spacecraft, Sigma 7, into orbit on October 3, 1962. Mercury-Atlas 8 (MA-8) was the fifth manned space mission and was launched as part of Project Mercury. General Dynamics Astronautics, the firm which conducted the launch, had the key gold-plated and engraved with the following message: "Wally Schirra (1923-2007), MA-8 Orbital Launch, 10-3-62 7:15 a.m." The opposite side of the key stated: "Atlas, Launch Console Arming Key, Mercury Sigma 7, General Dynamics Astronautics." Original black and white photographic print, 1962: Private Collection of Dr. Calvin D. Fowler. Digital reproduction of original black and white photographic print, 1962. "Schirra Presented with Launch Key from Atlas Crew." RICHES of Central Florida. "Mercury Atlas 8." National Space Science Data Center, National Aeronautics and Space Administration. http://nssdc.gsfc.nasa.gov/nmc/spacecraftDisplay.do?id=1962-052A. Astronaut Group 1; astronauts; Atlas; Cal Fowler; Calvin D. Fowler; Cape Canaveral; Cape Canaveral Air Force Station; CCAFS; General Dynamics Astronautics; Hangar J; Launch Complex 14; LC-14; MA-8; Mercury 7; Mercury Seven; Mercury-Atlas; Mercury-Atlas 8; NASA; National Aeronautics and Space Administration; orbit; Original Seven; Project Mercury; Sigma 7; space; spacecraft; U.S. Air Force; USAF; Wally Schirra; Walter Marty Schirra, Jr.
“Dr. 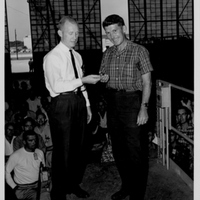 Cal Fowler Presenting Wally Schirra with Launch Key.” RICHES of Central Florida accessed April 26, 2019, https://richesmi.cah.ucf.edu/omeka/items/show/6394.